"It was Mickelson’s idea, his head-to-head record v Tiger is decent and you sense he’s the one that little bit more desperate to win." 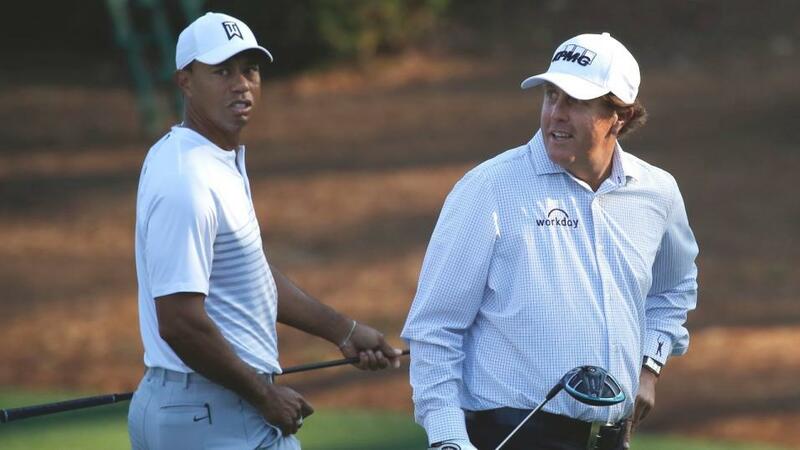 Roll-up, roll-up, it's Tiger v Phil. It's the World No.13 v the World No.27. It's the man who lost all four matches at the last Ryder Cup against one who also contributed zero points. Talking of pointless.... okay, you can see where my thoughts lie. But it's not just me wondering why this is actually happening. Justin Thomas: "Love TW and Phil to death.... but there's a 0% chance I order that. I'll be watching football!?" Rory McIlroy: "Look, if they had done it 15 years ago it would have been great. But nowadays, it's missed the mark a little bit." That said, it's a 'Yes' from Jordan Spieth. "I'm sure that myself and our friends will be watching it. There is certainly an interest from us, yeah, especially knowing the both of them. Having them mic'd up and knowing them personally it'll be kind of extra special." Although McIlroy has a valid point, perhaps five years ago would have been fairly good too as in August, 2013 the duo occupied the top two spots in the world rankings. It also seemed they had a genuine rivalry once upon a time. Nowadays? Tiger has mellowed, as you might expect of a man in his 40s who stared at retirement before the wonders of modern day surgery gave him a new lease of life. Phil is 48 and less than 18 months away from making a killing on the Champions Tour. Perhaps he's impatient and the dollar signs in front of his eyes have tempted him into this. The nitty gritty then. It's matchplay over 18 holes at Shadow Creekin Las Vegas. They begin at 12pm local time in Vegas which is 8pm UK. Crowds? It's not open to the public so just VIPs and sponsors. Less heads and bodies for Phil to bounce wild drives off? It's a $9m purse with the pair planning some side bets on putts/drives. Back to 2013 and whilst ranked first and third, the American duo were paired at the Deutsche Bank Championship. Mickelson sparkled in round one, throwing down a 63 against Tiger's 68 although Woods took revenge, 67-71, in round two. They locked horns again in the first two rounds of the 2014 US PGA, with Phil going lower on both days - 69 v 74 and 67 v 74. After a four-year gap, the two multi-major winners met up again in this year's Players Championship. It was there that Phil had the idea to take on Tiger in a special match. Sawgrass was quickly ruled out as a possible venue given that Mickelson shot 79 and 73 to Tiger's 72-71. Over the last 10 years it's been all square, the two winning seven each in their last 14 head-to-heads. Shadow Creek is a Tom Fazio design (2008) sculpted from the Nevada desert. It's a par 72 with an official yardage of 7,560 although I'm guessing they may play around with that if it involves driving par 4s or reaching par 5s in two. On the official site, a series of players and celebs take it in turns to describe each hole. "Surreal", says NHL legend Wayne Gretzky of the Par-5 4th. "It's North Carolina majesty in the middle of the desert," says NFL great Jerome "The Bus" Bettis. "In a practice round for fun, I would take a shot at driving the green. The ball goes a little further in Las Vegas and doesn't everyone take a gamble in this city?" says Davis Love of the par-4 11th which can play between 284 and 324 yards. Expect Phil to take driver there. Mickelson, himself, gets the nod for the closing hole, saying of the par-5 18th, "One of my favourite golf holes in the world." It has water in play off the tee and on approach. Tiger and Fred Couples hold the old course record of 60; Dustin Johnson a 66 after the 2008 Fazio redesign. A 2013 Golf Digest article said Tiger practises there. Phil is reported to have jetted in for a practice round just before the Ryder Cup. I'm probably going too far now but do either show a liking for Tom Fazio courses, the most famous being Quail Hollow? Mickelson loves QH, telling Fazio ahead of the 2014 Wells Fargo Championship: "This is perfect. I'm having such an enjoyable time playing this. This has become in my mind one of the best courses I've ever played. The beauty is in its simplicity." Mickelson shot a 63 on the way to T11 that year and has gone 4-4-5 in three appearances since to take his top ten count there into double figures. Conway Farms is the other Fazio design both have played in recent-ish times. Overall, Phil is ranked 6th in Total Strokes Gained on Fazio designs since 2014 (2.44 per round across 28 laps) so, as well as the location, perhaps his liking for the designer helped him pick Shadow Creek. Tiger's hugely impressive finish to 2018 tilts the odds firmly in his favour but would you back him in at 4/9 in something as random as this? Overall, you can probably argue this both ways - in which case a punt on underdog Phil is the way to go. It was Mickelson's idea, his head-to-head record v Tiger is decent and you sense he's the one that little bit more desperate to win in the here and now. Woods may be plotting a way to win a 15th major in 2019 so won't want to do anything daft to risk his back. Mickelson plays a lot of trash-talk money games when practising for big events so if we're building his case on marginal gains, let's throw that in there also. Matchplay will help Mickelson too. If his driving is all over the place, it'll cost him a few holes but not wreck the round. There's a worry that Mickelson really was dreadful in the Ryder Cup but Tiger wasn't any great shakes either, shooting even par in his singles v Jon Rahm (Phil was around +2 v Francesco Molinari). Both will be rusty. The result will not be a part of either's legacy. Ultimately, it's contrived and meaningless. But if you're going to bet on something contrived and meaningless in a two-horse race, getting 7/4 on Mickelson doesn't seem too bad.